Welcome to the haunted hovels section of Haunted places in Arkansas. Please select a link below to view information on that location. Please note that this section is always growing and new locations are frequently being added, so please check back if you don't find what your looking for. Alternatively, if you know of a haunted location in Arkansas that isn't in the list, then feel free to send me a message in the contact section and I'll will make it a priority to cover it for you. But for now, please enjoy what information has been provided. Inside this high school, the stage that is used for musicals and plays is reportedly haunted by a student who longed to be in a production. The director never cast him, and the boy told the director that one day he would be on stage. He later moved from the district and soon died in a car wreck. They say that about a week before the production, things are misplaced and go missing, but he never disturbs anything the nights of the production. There have been claims of orbs sighted in the basement, eyes seen in the corners, blood on the walls of most of the dormitories, and windows of the dormitories (especially in the girls dormitories) breaking at night, with no explanation as to why they are broken. Hauntings seem to happen mostly at night, although people have spotted orbs in the basement night and day. This college used to be an old orphanage that burnt down in the early 1900's. It is said that late at night, up in the chapel, students have heard what sounds like a rocking chair going back and forth. Then, down in the auditorium on certain nights, the walls are said to look like they are burning down. Around the chapel, there are four posts and there's only a shadow cast from three of them. Children’s voices, laughing and screaming has also been heard. On the second floor of this building someone or something was heard running down the hall and screaming.There was only one other person that reported hearing this. Another person was nudged in their bed, and scratching was heard on the desk next to her. Her roommate didn't hear any of this. One resident reported someone trying to open their door forcefully. When she got up, no one was even spotted near the scene. Right after she got back from checking her door, the air conditioner that had never been a problem before suddenly began making strange knocking noises. This house was established in the late 1800's in the French port community near Camden. Home to a young girl that was reportedly beaten by her parents, she was locked in her upstairs room until she died of starvation. Tales from travelers swore of ghastly sounds coming from the home, and strange mishaps have occurred to passing vehicles. The young girl is supposedly buried in an unmarked grave across the road from the house in Jones Cemetery. The cemetery itself has its own reports of strange occurrences. One example is mechanical parts of vehicles have gone missing after entering the cemetery's gate. Various orbs have been seen at night. People have also been seen down the hallways, and voices and an old-fashioned telephone has been heard at night. Doors and cabinets also open by themselves, and lights turn on and off by themselves. Early in 1893, an opera/comedy group that was led by John Orr and his young wife Ernze Mabel Orr came to Clarendon to perform at the local Opera House. After a performance there, the Orrs decided to make Clarendon their home. John Orr and his wife lived in a house with several black caretakers in the back. John Orr abused his wife and one of the hands helped Mabel make a curse called a 'hoodoo' to kill him. It didn't work, and so the abuse continued. Mabel and four of the others conspired to shoot John, and they succeeded in shooting and killing John. It soon came out that Mabel and the four others had killed him, so a lynch mob came to arrest Mabel and take her to jail. The four others (three men and one woman) were hung in the courthouse yard. Mabel took an overdose of morphine provided by the Sheriff as an alternative to the public lynching. To this day, they say you can hear her cry in the basement of the Courthouse, and can see lights along the levee that lead to the river where the four lynched bodies were carried across to be buried on the other side. Rumor says that a ghost of a young woman nicknamed the 'Galloway Virgin' resides in the attic. Oftentimes, people have felt a presence in the halls late at night. Noises, such as someone walking in the attic, have been heard. Cold rushes are frequent and people have even sensed an immense feeling of sadness when walking up the stairs toward the locked attic. In room 219, appliances have been reported to turn on by themselves and a presence has been felt in the room. Water comes on while no one is near the sink. A student residing in the room has felt someone lay down next to them at night. Objects have flown across the room. One person even felt someone pull her belt loop. Things are misplaced, and objects blow when there is no air on or window open. The Crescent Hotel used to be a hospital for the mentally ill. On the balcony, a female patient jumped to her death, because one of the doctors was molesting her. Bodies were burned in the furnace of the hospital. People today usually reserve rooms to actually see if it is spooky. One lady reserved herself a room, and the staff told her that she had to sign a contract saying that the hotel staff are not responsible for any accidents or mishaps during their stay. She supposedly died that night in her room, because she had a terrifying nightmare. She supposedly died of a stroke, because she was so badly scared. The building is reportedly haunted by an Irishman named Michael. On the second floor, the ghost of a nurse has been seen, pushing a person on a bed. Examples of other sightings are of a business man walking around in the lobby, a man pushing his wife down a flight of stairs, and a school girl being pushed out of a window to her death. This place also used to be a cancer patient hospital. The founder of the cancer hospital was Dr. Norman Baker, who was said to have buried his cancer patients under the floor of the old hospital morgue. He also used to have two St. Bernard dogs with him, and they died in the hotel. Sometimes people have reported feeling cold wisps of air hit their legs, as if they were being licked by a dog. Witnesses have reported seeing Baker in the basement part of the hotel, while going on a ghost tour. Some old women are said to pull their rocking chairs into one of the hallways in the middle of the night, and have a chat. There is reports a ghost of that is probably a large man. The ghost is active mostly at night. He has been known to push lightly on the bed and poke people on the shoulder. One person had heard something on the floor, like a person running his finger along the carpet. There were other small noises that could not be explained. There was no one staying in the next room that could have made any sounds either. This old estate is located along Highway 270, five miles east of Crystal Springs, close to the Garland/Montgomery County line. It is said to be haunted by the ghost of David Mayberry, the man who owned the Mayberry Inn during the 1800s. Legend states that David Mayberry used his inn to shelter prospectors and miners that were traveling through the area. Gunfights quite often broke out between the men, which led to the death of many people. It is said that one of the men's bloodstains can still be found on the inn's floor. The violence in the inn also led to David Mayberry getting shot. Although Mayberry was not killed, the bullets left in his body led to schizophrenia. Supposedly, because of his mental condition, Mayberry stabbed his wife to death and burned her body in the fireplace (which is still intact and displays a creepy message on the wall above it). Eerily enough, legend states that you will hear the wife of David Mayberry crying hysterically at exactly midnight. Also, legend states that Mayberry, after he killed his wife, drowned his infant son. Mysterious screaming can be heard coming from the bath tub in the basement. A former worker, and one of the people who helped run the loft told this story. It was on a Wednesday before the regular poetry reading. A woman was awake on a couch, but she couldn’t get her eyes to open completely. With her blurred vision, she thought she saw her friend walk into the kitchen. The woman asked a man sitting in a chair near her if there was anyone else in the room. The man told her that everyone was in the kitchen. She then felt a pair of female hands grab her roughly and hold her down to the couch. She yelled out to the man sitting in the chair, asking if there was anyone else in the room. He went to the kitchen and saw that no one was there and told her that they were the only two people there. As soon as he told her that, the hands let go. When the woman arrived for work the next day, she told her coworkers the story. She said that she had seen her friend out of the corner of her eye, and that the friend was wearing the exact same clothes that she saw him wearing earlier that day. The other person who was with her at the time said that he had been sitting in the chair the whole time, and had seen nothing out of the ordinary. He also said that he had seen the woman’s friend walk into the kitchen. Formerly known as the Strand Theater an apparition of a man has been seen by many people, including play cast and personnel. He has been seen in the attic, along the catwalk, the boiler room, the balcony, and the projection room. He has been affectionately named Charlie. He has appeared wearing different clothing at various sightings. According to one eyewitness account, he was sighted by a visitor who was making their way to the projection booth. As they rounded a corner in the balcony, they came face to face with Charlie, who was wearing a red shirt and casual pants. The visitor stopped within two feet of the apparition and made eye to eye contact. The visitor was not startled, because they believed it to be a friend of theirs. Charlie vanished before their eyes. Another eyewitness reported that they had seen him sitting on a heating duct in the attic, when they went upstairs to check on a faulty heating unit. There have been many other strange occurrences, as well as poltergeist type activities at the Strand theater since its construction in 1927. One of these took place as workers were unloading the new grand piano. When the workers left the room momentarily to take a break, the piano began playing a recognizable tune while still sealed within its packing crate. The piano was not a self-playing piano. Rumor has it that the theatre is haunted. During the most recent summer musical, there were various sightings of the mischievous ghost. A technician was cleaning up the dressing rooms, when they heard a young man laughing gleefully as if playing a game. Upon further inspection, they found that there was no one in the theatre, let alone downstairs with them. One of the lead actors was running lines in the upper level when the sound of a man’s voice began echoing. At first they thought it was one of the other actors, but all of the male actors at that rehearsal were onstage at that time. Before a performance, a few people involved in the production went to the theatre to set up. They decided they needed to turn on the lights from the lighting booth, so they headed upstairs to do it. About halfway up, the lights suddenly came on. The technicians ran up to find nobody up there. They shrugged it off and headed downstairs. But as they reached the bottom of the stairs, the lights went off again. A bit frightened, they went back upstairs, and still no one was there. This went on a couple more times before the technicians shut the system down and turned it on themselves. There are things that happen without explanation. Such as after closing time, when all the chairs are put up after people leave, a person can come back into the building and the chairs will be back down. There are strange sounds coming from different areas of the building. Also, cold spots are felt throughout the club and pizza restaurant. It is said that there is a ghost in the theater. The story goes that the ghost is one of a girl that was to star in a production one night. On her way there, she was killed by a train. She never made it there, physically. People have said that sometimes you can see someone walking along the catwalk during some of the performances. A person who is in drama and also the photographer for the yearbook, paper, etc. Stated that one night, they were the lighting control booth, going through the checks for the production the next night. They say that they were the only person there. They looked down onto the stage, and a rocking chair was rocking by itself. Being a photographer, they always had their camera with them. They picked up their camera and took a picture. Later, when the roll was developed, all the pictures came out perfectly. That is, except for the one of the rocking chair. It was blurry. At night, footsteps can be heard coming down the stairs. Voices are heard in the old cafeteria that can't be explained. It is believed to have been built on an old Indian burial ground. Also, water drips from the ceiling on hot, dry days. The most frequent sighting is the ghost of a little blond haired boy on the fourth floor. No one knows who he is, but he is about 5 or 6 and wears white pajamas. He is usually spotted by patients who know nothing of the ghost. He is usually playing or looking for a kitten. Sometimes there is more than one child. They have been seen on the fourth floor, in the garden, and in one of the stairwells. Another ghost sighting occurred in room 321. A very alert and oriented patient looked up from reading to see the room in blood red. A man in a confederate uniform was standing in the room. He said he didn’t do anything for a few minutes. Then, when he called the nurse station, the man disappeared and the room went back to normal. The fifth floor is supposed to host the ghost of an elderly female. And the ICU is also supposed to have had strange events happen. Late at night, presences have been felt in surrounding areas. They have been felt more prominently while standing on the steps once used for seating. While standing at the podium, people have seen people in cloaks, above on the rocks. There are three crosses sticking out of the top of a rock here also, and a very negative presence has been felt when near this rock. People have reported noises in the attic, footsteps on the stairs, and whispering in the hallways. The structure is built on top of an old Cherokee Indian Burial Site. The mounds were disturbed when groundwork was being done for the foundation. Supposedly also a girl committed suicide in a room. If you go by (its right in front of "Watta-Burger", which is famous in Arkansas) the front of the building, you can see that on the second floor, right in the middle, there’s a window bricked out. The girl was either having family problems or boyfriend problems and hung herself out of the window, so that she would be in front of the doors in the morning. There’s also a story that she hung herself in the closet, but the closets really aren’t big enough at Tech for that. The room is cut in half. One half is blocked off and the other is used as a storage space. They even expanded the room to make it a three-person room to fit all the girls in. Things like water leaking from the ceiling occur in all the rooms around it from time to time. It’s just a very eerie building. Also, every once in a while, the power will shut off in the building. The staircase in the old part of the building between the third and second floor is haunted by a student that choked to death around the 1960's. Also, the attic is said to be haunted by a janitor that had a heart attack while peeking through the peephole, watching the cheerleaders. They say you can hear him call out from the balcony of the auditorium, if you are in there alone. Also, the practice field was once a cemetery, and it was stated that even though all remains have been removed, that some of the unmarked graves still remain. 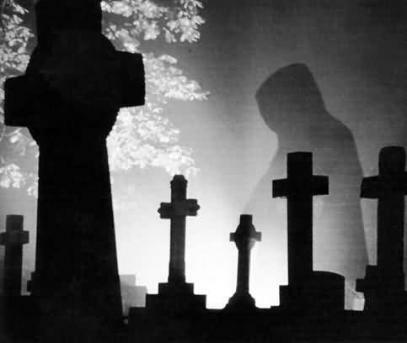 On foggy nights, you can see these ghostly figures, looking for the other graves that were marked. The Tazlina Lodge is not in use anymore. Long ago, a man had a stand-off with the police at the lodge. He stayed on the third floor. He died in the stand-off, and his spirit is said to still be there. Back in the 1950's, a family worked there as housekeepers. They experienced a lot of ghost activity at the three-story lodge. About five years ago, a family went on a tour of the lodge. It was a very warm summer day. They headed up the stairs, looking at the rooms. They were aware of the reported hauntings and they were scared. As they got closer to the third floor, the air got very cold(remember it was a very warm day outside). They went to the room where the man died long ago on the third floor. They don't know if it was a setup by the hotel owner, but there was a very dusty wooden chair in the room. It had an imprint on it, that looked as if someone sat on it recently. There was a smell of smoke from a cigarette in the small room. The owner told them that the ghost often likes to smoke in the room. A few people have reported picking up a female hitchhiker on a stormy night. She asks them to drive her to her house. When they get to the house, the driver turns to say goodbye, the girl is gone. The driver will go up to the house and ask the owner of the house about it. The owner will reply that this happens all of the time, since her daughter was killed in a car accident close to home.